Staten Island, NY/Press/January 30, 2019 – Stephen M. LaManna, CEO of The Computer Hospital of Staten Island was recognized as a Top Professional of North America 2019 – 2020 by The Who’s Who Directories. The accomplishments attained by Mr. Stephen M. LaManna in the field of Computer Services, warrants inclusion into the Top Professionals of North America. The Computer Hospital is located in the center of Staten Island and services the Greater New York area, they provide easy access at any location with skilled, quality “hands on” service. For over 25 years, The Computer Hospital has been providing upgrades and repairs for computers, they use high tech computers to fix computers and upgrade old computers to work and be current in today’s fast moving society. They are the first Computer hospital with professional and experienced Computer doctors that really care about your Computer. Computer hospital are fast and reliable and will remove all corrupted, damaged or spyware files that hold back your computer’s operation and allow all your programs to run freely without any interruptions. When they network your system, all computers can use all the same resources, like scanner. copier, printer and fax machines. They remotely fix your computer on a 24/7 basis. Monthly service plans and/or flat rate pricing is available. The Hospital is owned by Stephen M. LaManna, a native Staten Islander, who started the Computer Hospital on the the North Shore of Staten Island on Forest Avenue. His aim is to always please and achieve the highest level of customer satisfaction at all times. Computer Hospital has expanded its services and now accommodates the entire Island. Mr. LaManna does not want your computer to add stress to your life and make you feel frustrated. He knows no one likes a slow computer and you shouldn’t have to wait on any computer to do your work. Let the Computer Hospital come into your home/office to make your computer run to its fullest potential and optimize its work load. 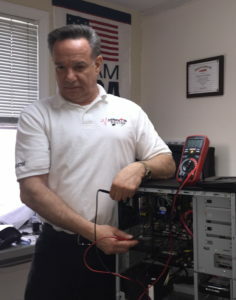 Mr. LaManna received a Bachelor of Science, in Engineering from Farleigh Dickinson, Associates Degree from Devry Technical Institute, Attended a Technical High School and worked with the New York State Police Information Network. He holds a radio license, an A Plus license; “Businessman of the Year”, 2004, Cambridge Who’s Who. He is a member of St. Theresa’s Church and Association called Endless Referrals. Mr. LaManna is married to Maria Del Carmen LaManna with three children. Be the first to comment on "Top Professional – Stephen M. LaManna"